Pokémon from the Hoenn region will spawn more frequently. A new event is now live in Pokémon GO and centers around Pokémon from the Hoenn region. Starting today at 1 p.m. (PST) or 4 p.m. (EST), Hoenn Pokémon will appear more frequently in the world of Pokémon GO. The Hoenn event will last until January 29 at 1 p.m. (PST) or 4 p.m. (EST), meaning if you need to expand your PokéDex with Hoenn Pokémon, now is definitely the time to do it. 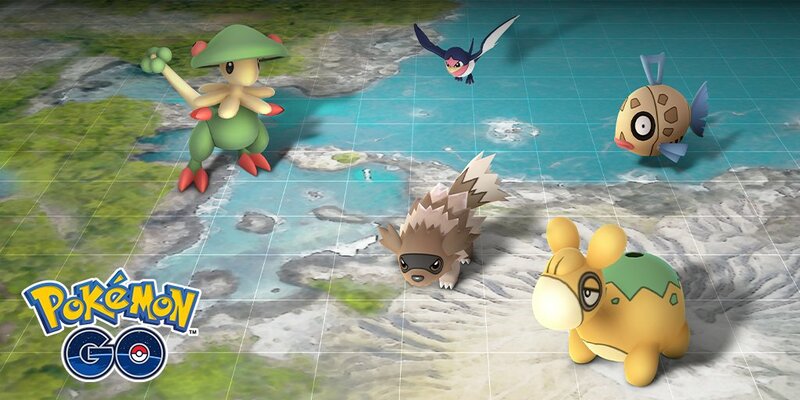 During the Hoenn event, Pokémon from the Hoenn region will spawn more frequently in Pokémon GO. If you’re unfamiliar with the Hoenn region in general, it launched with games like Pokémon Ruby and Sapphire. In the Hoenn region, you’ll find fun starters like the Fire-type Torchic, Water-type Mudkip, and Grass-type Treecko. All of these Pokémon evolve into powerful Pokémon like Sceptile, Blaziken, and Salamence. New avatar items based on Team Aqua and Team Magma will be added and available for purchase in the Style Shop. Field Research assignments will focus on Pokémon originally discovered in the Hoenn region. Raid Battles will offer Legendary Pokémon originally discovered in the Hoenn region like Groudon and Kyogre. 7 km Eggs have an increased chance at hatching Pokémon from the Hoenn region. Shiny Taillow and Shiny Zigzagoon have a chance to spawn during the Hoenn event. Breloom will know the exclusive move “Grass Knot” when evolved from Shroomish during the Hoenn event. Overall, there’s a lot to look forward to in the Hoenn event which is scheduled to run from today, January 15, until Tuesday, January 29. After reading the information posted by Niantic, what are you most looking forward to this month? Are you itching to expand your Pokédex with Hoenn region Pokémon, or will you be trying your hand at Raid Battles in hopes of landing a Groudon or Kyogre? Let us know your thoughts down in the comments below!